The new standard is stretched out on the assembly rack and in this photograph is nearing completion. 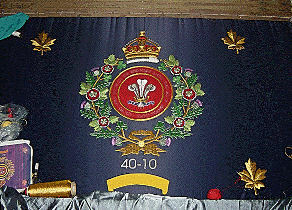 A Gold thread reel can be seen on the left of the table together with the template picture for the crest. Nearly completed but still on the assembly table, the design of the standard can be clearly seen. In each corner is a gold Maple Leaf signifying the relationship of the old 100th Foot with Canada. 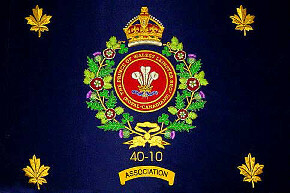 The central emblem consists of the Prince of Wales feathers on red base with the Regiment's title, surrounded by the laurels of the old 109th (Bombay) Infantry. 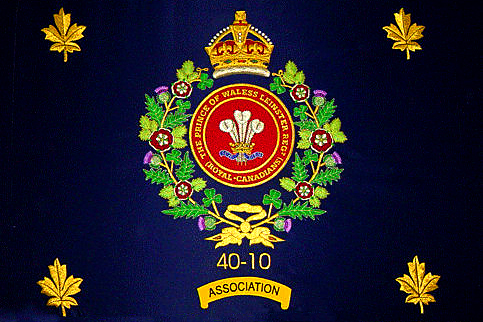 Between the Regimental crest and the scroll 'Association' are the numbers 40-10, the 'unofficial trade-mark' of the Leinster Regiment.